You are here: Home » How To Guides » Old A1WebStats System Guides » How to create a bespoke report (and have it emailed daily or weekly). 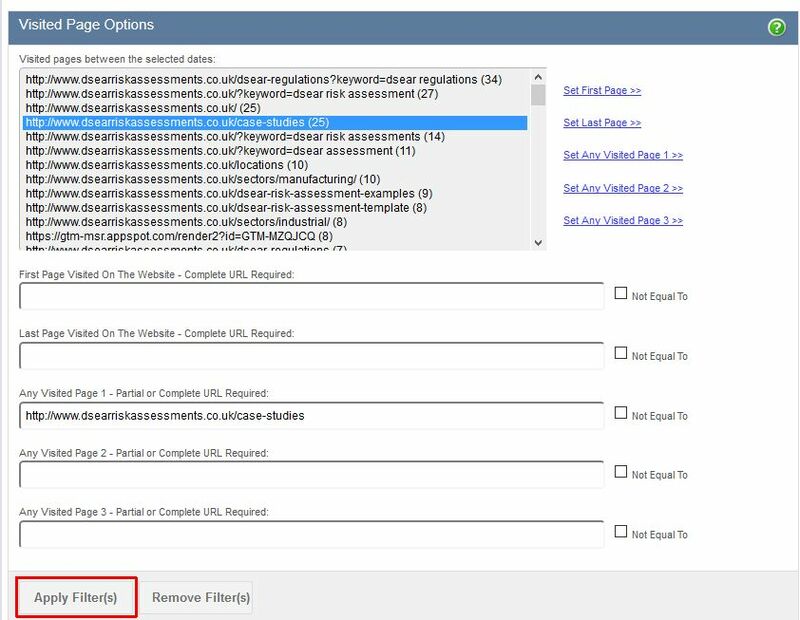 How to create a bespoke report (and have it emailed daily or weekly). Using bespoke reports allows you to have a much more beneficial picture of your website effectiveness than purely focusing on identifiable company visitors. It takes matters beyond Google Analytics, digging deeper into every individual website visitor that matched a specific pattern that you’re interested in. In Google Analytics, if you wanted to dig deep into those visitors who landed on one page, went to another, but didn’t go to a certain website page, then you can’t do it. With A1WebStats you can. This is incredibly useful when you want to fully understand the website movement patterns of individual visitors because, even though many can’t be identified as companies, many of them will still be people from companies (including those who are out of the main working environment), and so their website movements can highlight opportunities for improvement. 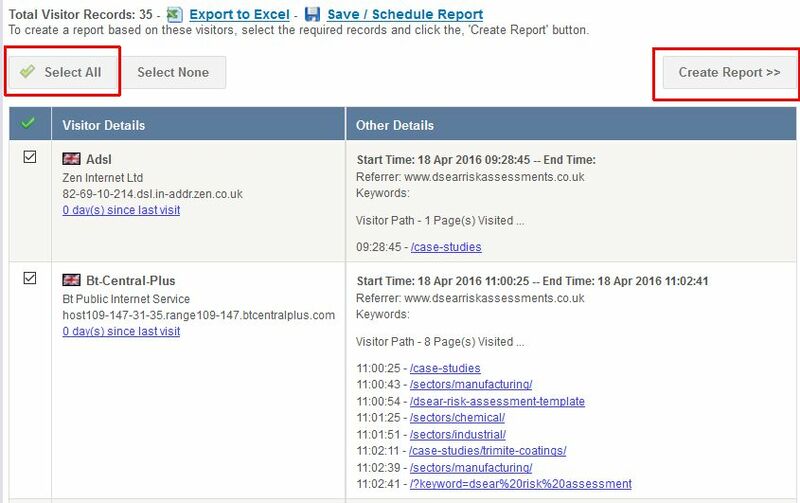 A1WebStats collects a lot of data about your website visitors and there are many scenarios where it would be beneficial to have bespoke reports generated by the system and emailed to you (typically daily). You want a daily report showing you visits from Google Adwords that went no further than the landing page (to highlight weaknesses within the Adwords or website itself). You want a daily report showing you identifiable companies from one country who went to a particular section of your website. 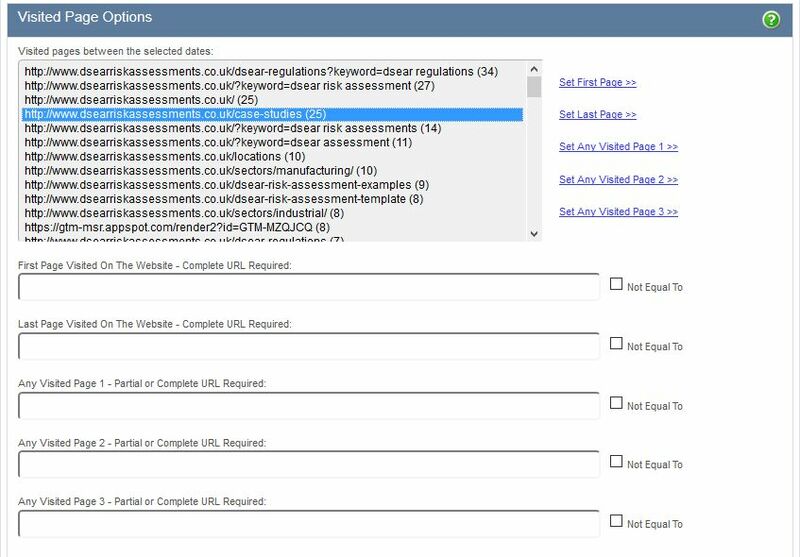 You want a daily report showing you the paths people took before completing your website enquiry form. You want a weekly report showing you people who clicked through from your email marketing campaigns and where they went page by page after clicking through. You want a weekly report showing you total visitors who landed on one page and who got to another specific page during their journey. The combinations are endless and because this is one of the more complex areas of A1WebStats functionality, we would encourage you to contact us to run through the creation of bespoke reports, focusing on your own data so that it’s more meaningful to you. From the Dashboard select a date range (using the date picker tool on the top right), within which the data patterns may have happened (typically, a week is about right). Select ‘Advanced Reports’ after hovering over ‘More Reports’ in the main navigation bar. Raw data will be shown, based on the date range you have selected. 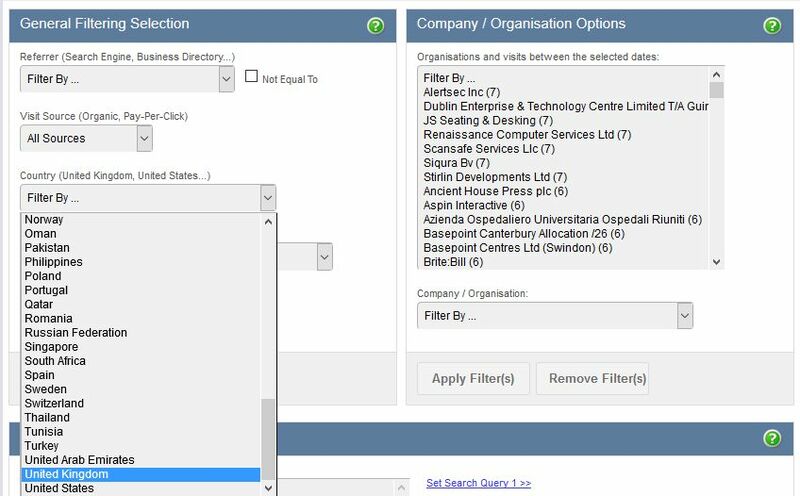 Within the General Filtering Selection part of the page, filter by Country and select your country of choice. Click on the Apply Filter(s) button. 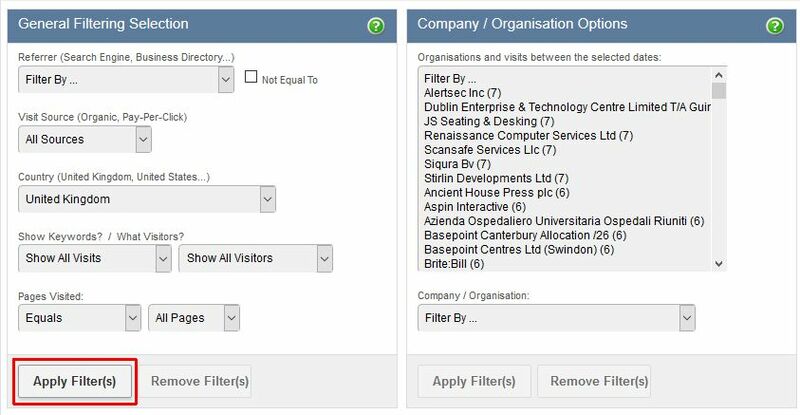 For information, all Apply Filter(s) buttons throughout the page will work, regardless of where you are positioned. You will be taken to the bottom of the screen where you will see a line of ‘Total Visitor Records’, showing you the number of records that have been extracted below, covering that date range you chose. To add another filter to the one already chosen, scroll up the page to the ‘Visited Page Options’ section. Then click on one of the urls shown, which turns it blue as in the example below. You can keep adding filters on as required. With that report generated you may then want to email the report to someone and so can click on the ‘View Report’ link at the top of the page. You can then copy the url from the top of the browser and email it to anyone that wants to click on the link and see the data. The data you have filtered may be data that you want to be automatically emailed to you so that you can quickly respond to the patterns of interest. 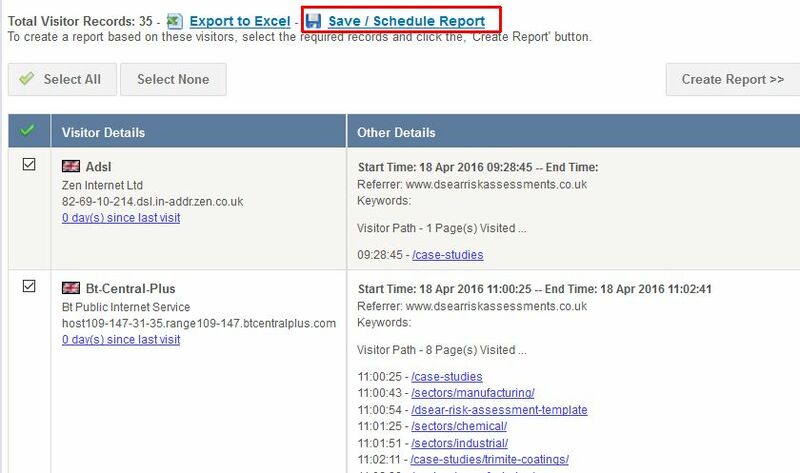 Click on the ‘Save/Schedule Report’ link towards the top of your data. Create a name for the report (that’s meaningful). 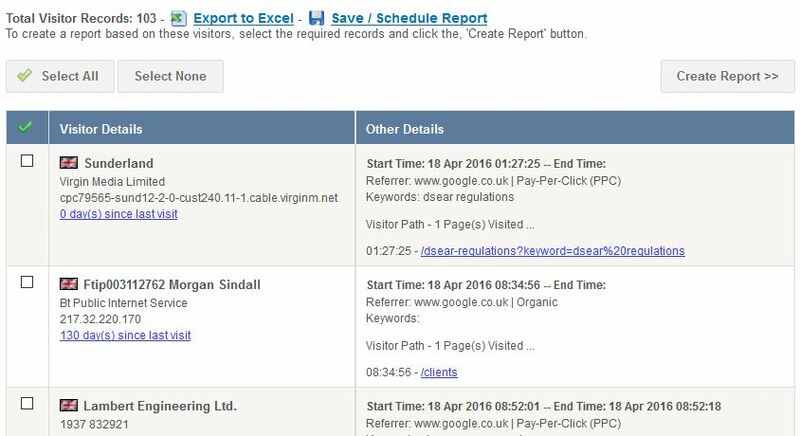 For example ‘UK visitors to case study pages’. This is the name of the report that will appear in the email inbox of the recipient each time it runs. Type in the email address of the recipient. If wanting more than one recipient, use a comma between each email address. Recipients won’t have to log into the system to see the report data – they will just click on a link. Select the email frequency. Most reports are run daily. Weekly covers the past 7 days. Then click on ‘Save’ and you will see your report appear within the ‘Advanced Reports’ column towards the left of the page. Each report will run each day/week/month if the parameters that you created are matched, and will then email the report to the recipients. If the parameters aren’t matched then the report doesn’t run. If you want to edit the report at any time, click on the pencil icon. This only lets you edit the name, recipients, and frequency. If you want to edit parameters you will need to create a new report. If you want to stop the report emailing (but still retain it to run manually at any time you want to) then just remove the email addresses via the pencil icon. If you no longer need a report then just click the X button.